Grassy downs, peat bogs, moorland and forest glades, from Siberia to west Wales, have for centuries been sites of an age-old dance of love. 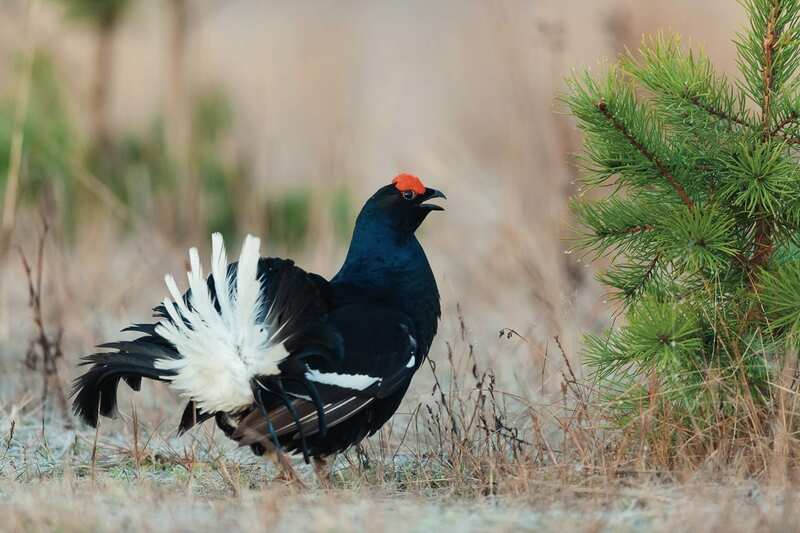 Black grouse (Tetrao tetrix), impressively clad in bright black, white and red plumage, gather together in groups of 20-40 bachelors, known as ‘leks’. Then the competition begins. The male courtship display is quite a performance, crouching low and circling the ground, they spread their black tails to reveal the startling white of their under-tail coverts. Partially extending their wings during the display, they puff themselves up and inflate the vivid red wattles above their eyes. They produce a bubbling and distinctive rooo-kooo sound, so enthusiastically delivered that it can be heard a kilometre away. Individual males return to their traditional lekking sites, and defend their territory. Dominant males occupy the central positions, securing the most females. The hens only attend these displays in April and May, observing, hidden in tall grass. Unfazed, males will lek most of the year (excluding their moulting months of July and August), regardless of whether the ladies are watching. However, they up the ante when joined by the hens in spring, and the lekking reaches its peak. Sadly, predictably, this charming scene has all but disappeared from British countryside over the past century. The same old story of habitat loss and fragmentation explains the absence of the black grouse; intensive farming and forestry plantations have destroyed the mosaic of habitat that they require to thrive. Strong populations could withstand disease, weather and predation, but the dwindling numbers and fragmented populations left in Britain cannot endure these environmental pressures. Populations declined rapidly from the early 1900’s, and black grouse are now extirpated throughout most of the UK. There are an estimated 6510 lekking males UK-wide, a stronghold of 3370 displaying males in Scotland, and lesser populations present in northern England and Wales. Scotland shares a long cultural heritage with the black grouse, their feathers are used for hats in traditional Highland dress and Scottish military attire. Ideal black grouse habitat is the transition zone between forest and moorland heath, a mixture of dense woodland, understory, scrub and bogs, the different spaces utilised with the turn of the seasons. Dense forest provides shelter from bad weather in winter and conifer needles provide year-round nutrition. Their diet is seasonal and includes plants, berries, seeds and insects. Open grassland provides a nesting and foraging site, the females hatch between 6-11 eggs from late April to early June. Boggy areas are important foraging grounds for young chicks. The restoration of the Cambrian Wildwood, a rich mosaic of habitats, will enable the black grouse to flourish once more in west Wales. Black grouse can while away harsh winters in the peaceful woodland, and breed, nest and feed on the re-established heather moorland and wetland areas in the warmer months. The reintroduction of black grouse would help restore wonder to our little corner of the Earth. Golden, leafy mornings in the Wildwood will be an arena for these fascinating animals, a place to come and marvel (discreetly!) as they perform their enchanting and ancient rite.